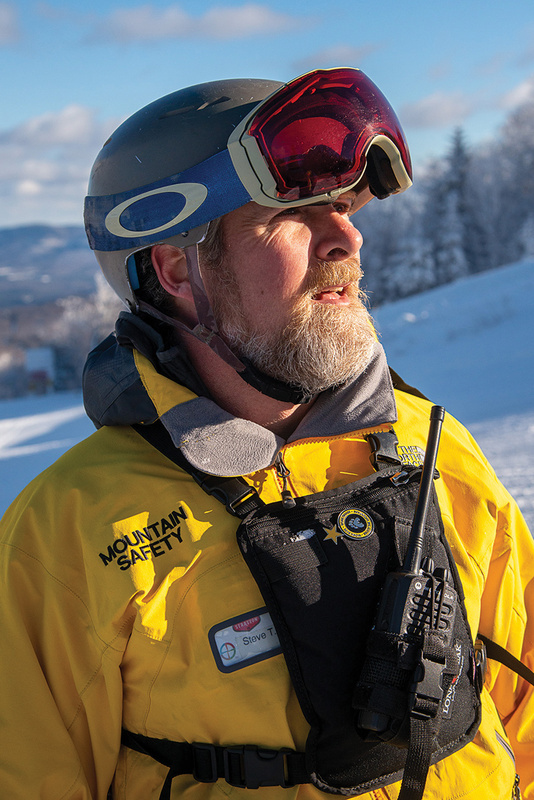 The Stratton Mountain Safety Patrol, the guys and gals cruising the mountain in the bright yellow jackets, works hand-in-hand with the ski patrol to promote safety and to enforce the code of conduct that shapes responsible skiing and riding. The vast majority of guests know and obey the common-sense rules laid out in the skier and rider responsibility code, which is posted throughout the mountain. That includes important reminders such as always skiing or riding in control, yielding to the downhill skier, and observing all posted signs and warnings. In an effort to keep everyone happy and healthy on the trails, the Safety Patrol is on the lookout for infractions such as skiing or riding too fast in slow and family zones or guests who try to “poach” closed trails. Skiers and riders will see Safety Patrol staff at a variety of different positions on the mountain. They work the base of the lifts to help traffic flow and safety, the beginner and family areas to help young children and rookies get down the slope safely, and there is always a safety patroller at the summit to do everything from helping locate lost skiers to helping locate lost gloves. The all-volunteer squad currently consists of 35 men and 5 women who range in age from their early 20s to late 60s. All have completed at least a year of training including a course in basic first aid. “They’re trained in life-saving measures like CPR because they are often first on the scene of any mishap and must administer first aid until the ski patrol arrives,” Truskoski said. While the National Ski Areas Association has designated January as National Safety Month and Stratton Mountain joins resorts across the country in the campaign, educating skiers and snowboarders about being safe and using common sense on the slopes is a daily focus. This year, Stratton Mountain encourages all skiers and riders to view a new educational video with a link to register for ICE, the In Case of Emergency system. ICE is a free online program that allows members of the Stratton community to register their ID and contact information for all of their family and/or ski party members. With this information, the on-mountain Carlos Otis Clinic is able to contact designated individuals immediately In Case of Emergency. Go to carlosotisclinic.org/ice to sign up. Here are some more safety tips for skiers and snowboarders from members of the Stratton Ski Patrol and mountain Safety Patrol. Always ski or ride to your ability and stay in control. When stopping on a trail, pick a safe place out of traffic. When starting downhill or merging onto trails, look uphill and yield to others. Observe all posted signage and warnings (slow zones, closed trails, expert only, etc.). Use devices to prevent runaway equipment. Always bring a buddy when entering the glades. Prior to using any lift, have the knowledge to load, ride, and unload safely. Always use lift safety bars; it is Vermont law. Take a lesson; every skill level can benefit from professional instruction. Carry a trail map and have a meeting place set if you get separated from your group. Wear layers and dress appropriately for conditions. Have water handy and stay hydrated. In the terrain park, look before you leap. In case of emergency, call the Ski Patrol at 802-297-4911.